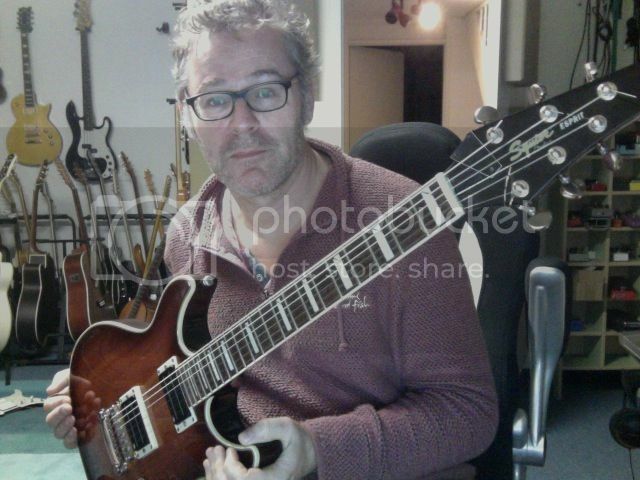 Hi, I'm Steve, backing track producer, here with my poor man's RF guitar, currently fitted with OBLs, though not sure if they'll stay on, very bright and brittle. Need some replacement tuners though, cant seem to find any with the same pin dimensions as on this guitra, most 2 pin tuners seem to be about 9.8/10mm spacing on the holes, those on here more like 12mm, and the Grovers that are currently on wind backwards if you get my drift. Posted: Fri Dec 11, 2015 5:48 am Post subject: Welcome! Welcome to the group. I've got that same guitar. I still have the stock tuners on mine, and the guitar hold a tuning pretty good, so I'm not looking to replace them just yet. I replaced my original p/u's with Seymour Duncan's. I have a JB in the bridge position and a Jazz in the neck. Hope you enjoy your time here. It's been kind of quiet lately, but hopefully that will change. Indeed it has been quiet, but welcome to the forum. I have been using backing tracks more than ever it seems. We need plenty of fresh RF tracks, least I do! Sorry I can't help you with the tuner issue though. no RF yet, though "Nothing to Nobody" is a firm favourite. I don't know if that is just a coincidence but I am currently working on Nothing for Nobody and I can assure you there is no backing track I could find out there! I would love to have Sahara Moon and Top Down Blues as well...but hey...the trio pedal is helping! Nope, tried to view, no can do. email me if you want first refusal! A fantastic Nothing to Nobody backing track just became available on Robben's new True Fire In The Jam video. That is bizzare. I saw that jam series yesterday and thought it might be a good investment. I was not sure if NTNB was Nothing to Nobody but it was a good guess. Someone posted one here (http://www.guitarbackingtrack.com/play/ford,_robben/nothing_to_nobody.htm) as well, which I played to and it was about right. Still interested in the jam series. Did you purchase it? I was looking at the Larry Carlton 335 backing track on TrueFire as well but at $50 that seemed pretty high. I did purchase it and I love it. Worth every penny. With each video you've got control over which view you're looking at, which commentary you're listening to, and a sound board that lets you use sliders to control the levels of the different channels. Let me know if you want to know anything else about it. I think I am just going to go for it as well. If it works out I might feel more confident in spending $50 on the Larry Carlton 335 program as well.